Stop Nick Griffin in Barking! London Underground: vote yes for action on pay! Sussex University: Reverse the boycott Israel policy - fight for positive solidarity! They messed up earlier in the year, in September, but armed with lessons and nerved from their recent successes in Manchester and Leeds, the English Defence League (EDL)/Stop Islamisation Of Europe (SIOE) and fellow travellers are due back in Harrow, north west London, on Sunday 13 December for another go at the central mosque. That demonstration follows an EDL mobilisation and counter-demonstration in Nottingham on 5 December. Popular pro-democracy protests have once again flared up in Iran on 7-8 December, with state authorities clamping down hard on activists — many of them students — by using arrests and violent repression. As Nick Griffin announced his Parliamentary candidacy in Barking and Dagenham, Solidarity spoke to Dave Landau, an independent socialist and anti-fascist campaigner active in the Redbridge & Epping Forest Together campaign. The BNP is very strong in this part of London; they really believe they’ve got a chance of winning control of the council. I’m not sure they will, but they could certainly become a stronger opposition. The English Defence League staged one of their largest demonstrations to date in Nottingham city centre on 5 December, drawing up to 500 of their members. Although smaller contingents of the organisation were scattered across the city centre throughout the day, the group assembled at around 1pm — staging a rally. Union Jacks and “No to Sharia” flags were waved aggressively as members chanted and shouted “we want our country back”. 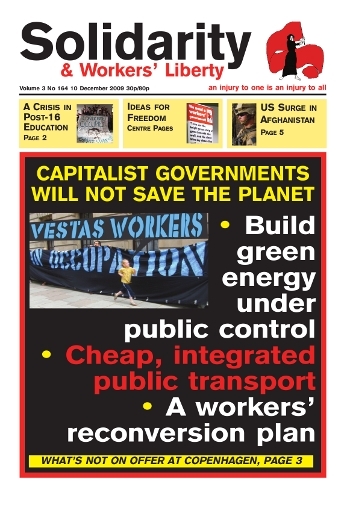 A presentation by Indian Marxists Jairus Banaji and Rohini Hensman, from Ideas for Freedom winter 2009, a weekend of socialist debate and discussion hosted by Workers’ Liberty on 28-29 November. From a left-wing point of view, it’s important to emphasise that there’s always been a lack of class politics in India. That’s one of its most distinctive political features. On 27 November Ed Maltby attended a small protest in front of the Polish Embassy in London in solidarity with workers and trade union activists who have been sacked from the Cegielski factory in Poznan. The Cegielski plant is one of the best known factories in Poland. It produces various types of engines. This summer 20 per cent of workers of the factory were sacked. On 23 October four thousand of workers demonstrated in Poznan against the layoffs in Cegielski. In Britain genealogists can be found in your local library. In Russia they can end up behind bars. This was one of the many illuminating and worrying facts in John Sweeney’s brave but flawed documentary (Stalin’s back? BBC2, 2 December) about the way Stalin’s reputation is being rehabilitated by the current Russian regime. Sometimes struggles come along that help us learn, or relearn, many basic and valuable lessons about what it means to be a working-class activist engaged in the fight for socialism. The struggle that took place on the Isle of Wight in summer 2009 to prevent the closure of the Vestas wind turbine blades factory was such a struggle. It taught us, against ruling-class myths about the non-existence of class or the passivity of working people, that workers can and will fight — even when they are unorganised and have no history of militancy. Members, supporters and friends of the Alliance for Workers’ Liberty gathered in London over 28-29 November to discuss “How to fight capitalism”. With sessions ranging from introductory discussions on Marxist ideas to in-depth debates on the capitalist economy and its future, the weekend was geared towards re-arming and equipping revolutionary socialists with ideas for the battles to come.